Here in the mid-west we have pretty high humidity. I love it for the most part. My skin doesn't crack. My nose rarely bleeds. My hair is curlier. I still use lotion but only once a day. We, like most people, don't like the humidity to be high in the house. That's where the AC comes in. It leaves enough for us to be comfortable. In our new house it seems the humidity is even higher. We've had to buy a dehumidifier for the basement because water was dripping from the ceiling. Not good. 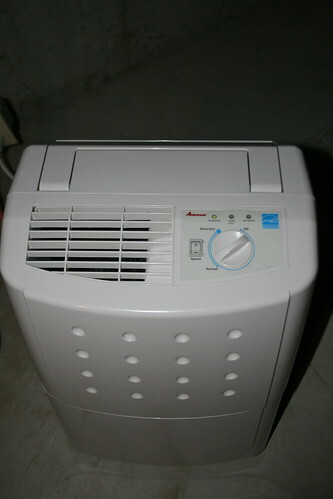 Every night I empty and start the dehumidifier. It takes 12-14 hours for the 2-2.5 gallon tank to fill up. I believe we could have a pool in the basement if we didn't run it all the time. Mickey and I were discussing why we have to run it everyday here when we almost never had to run it at the old house. (The previous owner wasn't running one.) The only difference we could come up with is that our current basement is pretty empty and not finished. (The previous owner had the basement filled with crap. I guess it absorbed the moisture.) Anyone have any other thoughts? Like I said, pretty lame. In other news, I bought paint for the kids bathroom along with towel bars, a hook, and a light fixture. I will post when it's finished otherwise a lot of posts over the next few months will all be about painting the house. That'll get boring for sure.